The San Rafael Pacifics of the Pacific Association of Professional Baseball Clubs made history Friday when they wore uniforms based on those worn in the All-American Girls Professional Baseball League to show support for Breast Cancer Awareness. The Pacifics became the first men’s professional baseball team to ever wear a dress as a part of their uniforms. Two uniforms were autographed by Tom Hanks – who starred as Rockford Peaches coach Jimmy Dugan – and were auctioned off after the game with all the proceeds going to “To Celebrate Life Breast Cancer Foundation,” an all-volunteer breast cancer foundation. Members of the Pacifics also signed jerseys to auction off, hoping to help raise whatever money they can to support Breast Cancer Awareness. It’s definitely something different, but it probably won’t catch on with other teams. 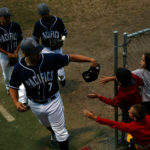 Either way, kudos to the Pacifics for trying something new.